I recently returned from visiting Prague as well as several of the places that Aldar visits in his search for the Golem of Prague. http://www.aldarandthegolem. The origin of the Astronomical Clock was misrepresented for centuries. It was believed, that the author was clockmaster Hanus, also called Jan of Ruze, who lived in the 15 th century. The story said that the clock was admired by many foreigners, but Hanus refused to show construction plans to anybody. When Prague Councillors found out that he was going to make another, even better clock, they became jealous and blinded him so he could not finish it. Later he allegedly damaged the astronomical clock in revenge, and nobody was able to repair it. The real author of the clock was discovered in 1961 in an old document, which describes the astronomical dial and says it was made by Mikulas of Kadan in 1410. He probably cooperated with the astronomer and Charles University professor Jan Sindel. 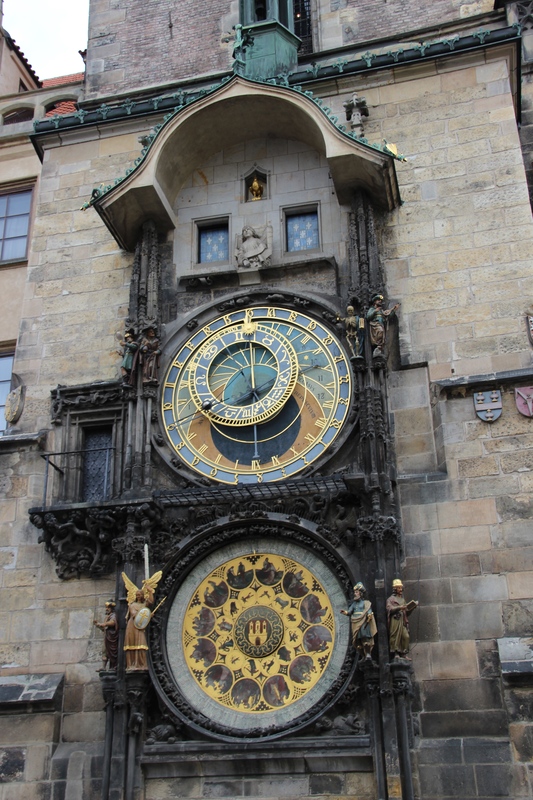 The Astronomical Clock was repaired and improved by Jan Taborsky in the 16 th century. However, it became very faulty as time went by, and it was mostly out of order. It was even considered whether it should be liquidated in the 1780s. The clock soon stopped working for a long time. The major repair was inevitable and it came in 1865. The clock was modernized and a new Calendar Dial was painted by Josef Manes. In 1945 the German army damaged the Astronomical Clock and some of the statues burned. They were replaced by replicas later, and the striking of the clock was changed from the Old Czech Time to the Central European Time. The Astronomical Clock consists of the windows with apostles at the top, the Astronomical Dial, which is the oldest part, the Calendar Dial underneath and various sculptures around. The wooden figures of apostles with their attributes appear in the windows every hour, while at the same time some of the sculptures begin to move: the Death holds its hourglass and beckons to the Turkish man sculpture, which shakes its head in response. There is Vanity portrayed as a man with a mirror and Miserliness as a man with a moneybag, shaking a stick. The other statues, that don´t move, are an Astronomer, a Chronicler, a Philosopher and an Angel. When the apostles finish their journey, the golden cockerel at the top crows and quivers its wings, the bell rings and the clock chimes the hour. The Astronomical Dial shows the medieval perception of the Universe: the Earth is the center. The blue part of the dial represents the sky above the horizon, the brown part the sky below it. There are Latin words ORTVS (east) and OCCASVS (west) written above the horizon, andAVRORA (dawn) and CPEPVSCVLVM (twilight) below. There is a Zodiac ring, which represents the stars in the sky and it moves according to it. The two clock hands bear the signs of the Sun and the Moon. There are three circles on the dial, showing different time: the outer circle with Schwabacher numerals shows the Old Czech Time (“Italian Time”), the circle with Roman numbers shows the Central European Time and the inner circle with Arabic numerals shows the “Babylonian Time”: the length of an hour differs there according to the season – it is longer in the summer, shorter in the winter. The Prague Astronomical Clock is the only one in the world able to measure it. Furthermore, the little star by the zodiac ring shows the sidereal time.